The last 15 years have brought tremendous changes to the mental health field, specifically the reduction of stigmatizing language and visibility of mental illness in high-functioning celebrities, political figures, and our own communities. Much like other cringe-worthy references to individuals facing social, physical, and emotional complexity, pejoratives in the addiction treatment field are falling out of grace. With the spotlight on opioid addiction, and focus across behavioral and physical health care on person-centered care, shaming and blaming language such as "addict" and "abuse" are now frowned upon in most addiction treatment circles. But what did it take to get here? We know very well with the unrelenting statistics on the morning news that "those people" are our people—that "them" is us. But change has been slow. Nuanced reform and transition to less stigmatizing language is happening across agencies and departments in state and national governments, but what about in therapy offices? In hospitals? Around the dinner table? In clinical supervision? How is the social work world embracing this less judgmental, recovery-oriented vernacular and using it in day-to-day interactions with clients and families? What about community and corporate stakeholders? Even those holding high positions in state government agencies overseeing mental and behavioral health initiatives have yet to adopt "disorder" vs. "abuse" or "person with substance use disorder" vs. "addict." References to those seeking treatment or behavioral health care in general is widely debated: client, consumer, patient, customer … all can elicit different reactions around the power dynamics in providing health services. "Client" and "patient" will be used interchangeably throughout this article. But those terms may be the least of the treatment community's concerns these days as clinicians and subject matter experts work to undo decades of misunderstanding of addiction, those managing their disease, and the treatments shown to have the most successful outcomes. "The use of 'abuse' and 'abuser' has been shown to increase stigma even among highly trained clinicians, who recommend more punitive treatment when an individual is described that way. We do not call patients with diabetes 'sugar abusers,' nor do we say their blood is 'dirty' with sugar. Describing patients as having a 'substance use disorder' demonstrates that their illness does not define them, just as we should no longer call a person with schizophrenia a 'schizophrenic,'" according to Sarah Wakeman, MD, FASAM, medical director of the substance use disorder initiative at Massachusetts General Hospital in her 2016 Harvard Health Publishing blog, "Words Matter: The Language of Addiction and Life-Saving Treatments." Wakeman suggests that one must also be mindful that describing treatment as "replacement" or "blocker" saddles life-saving medication, e.g., methadone and buprenorphine, with the same stigma individuals seeking care are trying to prevent. This stigma is a major deterrent to those attempting to engage with treatment providers. The impact of stigma runs much deeper. Per Sharon K. Davis, MSW, MA, CASAC, and Susan Palmer, LCSW, CASAC, cochairs of the NASW-NYC addictions committee: "There are so many stigmas about race and class as it relates to individuals seeking substance use disorder treatment. For example, the 'drug addict' was defined as one of the 'undeserving poor' when it came to services and responses. Often incarceration is the response—punishment for having an addiction. The opioid crisis has changed all that." Treatment modalities have transformed over the years as well, with the evidence base growing for medication-assisted treatment for some substance use disorders and the dismantling of the longstanding notion that addiction is a moral failing. Molly Cherington, MSW, who works in health care innovation and administration for Los Angeles County's Correctional Health Services, credits the adoption of a trauma framework, and ultimately the movement toward trauma-informed care delivery, as integral to the reformed understanding of addiction not only as a disease but also as a widely experienced outcome of traumatic experiences. "Though it can't be assumed someone has a history of trauma if they are in treatment for a substance use disorder," Cherington explains, "the idea that substance use could be a coping mechanism for anything at all could support anyone [in] remembering the use of chemical substances is a behavior, not a person, and that there's also a person there with a complex set of stories, experiences, hopes, and goals." Per Davis and Palmer: "We all know that terminology matters. What does it mean to define someone as a 'crackhead,' 'junkie,' 'pothead,' or 'drunk'? The DSM-5 … gives us the language for relating to our clients. Clients have diagnoses, and someone who meets the criteria for the [disordered] use of alcohol, for example, has been identified by the DSM-5 as 'a problematic pattern of alcohol use leading to clinically significant impairment or distress, as manifested by at least two criteria, occurring within a 12-month period.' The language we use demonstrates an understanding and acceptance of the disease model of addiction whereby improving the way in which we receive the individual." The best intentions get lost on those now "in the know" and at professional meetings or gatherings of experts in addiction treatment, use of the now-taboo words earn a questionable look from those who've embraced a less-antiquated vocabulary. 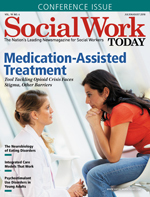 According to NASW Standards for Social Work Practice With Clients With Substance Use Disorders, guiding principles call out the importance of understanding an individual's experience in the context of a system that may be fraught with "social stigma and common misperceptions related to substance use disorders, diagnosis, and/or treatment." As Davis and Palmer describe the DSM-5 diagnosis criteria for a substance use disorder, the NASW standards called out the same "change in conceptualization ... addiction is no longer viewed as an 'either/or' phenomenon" with regard to dependence or misuse. Not only has this change in diagnosis criteria sparked a cultural shift in how addiction is perceived but more individuals may meet eligibility criteria to receive services at earlier points in their disease. One of the most highlighted changes in trade and academic addiction literature is the dropping of "addict," "alcoholic," and "abuser," and replacing the reference with "a person dealing with, or diagnosed with" a particular use disorder. This switch untangles the disease state from the identity and definition of a person, either self-imposed or public. However, the recovery community has not wholly embraced the change in clinical and political references. And for many, the self-identification as an "addict" may contribute to motivation toward treatment and long-term recovery. Cherington also sees a place for language that persons in recovery use to self-identify: "I've talked with some people who have even found the language to describe themselves (e.g., 'I'm an addict') as a way to 'other' the part from which they'd like to disassociate. It's not for me to 'correct' anyone in their own use of identity language, but an opportunity to bring awareness of a need to separate or isolate addictive behaviors—as something shameful vs., for many, a means of survival until other resources are available—can be powerful." In 2012, the Research Recovery Institute was founded and subsequently released the Addictionary, a user-friendly guide to 200-plus recovery-oriented terms and phrases common in the addiction treatment field that may otherwise be misunderstood or misused, or underutilized as more appropriate references. "If we want addiction destigmatized, we need a language that's unified. The words we use matter. Caution needs to be taken, especially when the disorders concerned are heavily stigmatized as in substance use disorders," according to the Recovery Institute website. The repercussions of continued use of stigmatizing language are beginning to segregate the old-school legacy treatment models from newer, evidence-based approaches to care that embrace and promote person-centered-care, and move away from the model of moral failing. Cherington says, "I think the conversations we have with our peers to understand and 'correct' without shaming can be powerful." Other resources, such as the NASW Standards for Social Work Practice With Clients With Substance Use Disorders, offers relatable and easily implemented strategies and philosophies throughout the publication that acknowledge the impact of terminology and word choice. Specific recommendations are given for attending to the influence of cultural issues on the presence of substance use disorders in individuals and communities. Social workers in a variety of settings are poised to model destigmatized language reflective of a more understanding response to substance use disorders. With more tempered language comes more tempered consequences related to criminalized drug use. As per Davis and Palmer: "This has resulted in more resources becoming available to communities—like Narcan (the antidote to heroin overdose) being readily available, and a softer response to the problem. The focus now is on rehabilitation rather than incarceration. When the white middle class is impacted, as it is now, language changes, as do the consequences." Sadly, communities of color have long dealt with the harshest response to substance use disorders and their consequences. There is work left to do in mental health care as a broad institution, and as the opioid crisis remains in the spotlight there are key barriers that still need breaking down in addiction treatment to continue on the path of destigmatization of substance use disorders. "Honestly, the system of care delivery doesn't work well. And that continues to make it look like individuals are 'failing' at their own treatment," Cherington says. There is strong sense that the system is challenging, regardless of means, creating too many opportunities for individuals to fall through the cracks and experience a stigmatized response to seeking treatment. Increased compassion and accuracy in the descriptive vocabulary of clinicians can power the cascade of change through institutions working to reduce or reverse the consequences of drug use on individuals and families. — Kerianne Johnstin Guth, MSW, is a health care administrator for behavioral health and addiction medicine programs in Camden, NJ.